He has been watching boats on the Bosphorus strait for two decades; but, until recently, it had been years since Serhat Guvenc had glimpsed a Russian warship. Common in the Cold War era and again during the Balkans conflict, they had become a rare sight on the mighty waterway that transects the ancient city of Istanbul and separates Europe from Asia. Now, barely a day goes by when the academic and amateur ship-spotter fails to catch sight of a Russian missile cruiser, landing ship or submarine. They goad Turkey by sailing through the heart of its biggest city to supply the conflict in Syria. “It’s like rubbing salt on an open wound,” Mr Guvenc says. Turkey and Russia have supported opposing sides in the Syrian conflict since the uprising against President Bashar al-Assad began in 2011. Since November, when Turkey shot down a Russian Sukhoi-24 jet, the relationship has teetered on the brink of all-out war. But thanks to a 1930s treaty, in peace time foreign states “enjoy the freedom” to send military and commercial ships from the Black Sea down to the Mediterranean. For Mr Guvenc, 51, and a group of four friends, the parade of military hardware through their city is irresistible. Sipping coffee from a stunning balcony with a panoramic view of the channel, they explain that the photographs they share online are pored over by military strategists and analysts around the world. Modi is wasting his 18 hours of work by being invisible to his party workers and support base. His work is not just about running the PMO efficiently, but about talking to his people consistently and courageously. Every hour he spends talking to his support base and the country on important issues will give him better political outcomes than every day he spends in the PMO. If the Rohith Vemula, Kanhaiya Kumar, and employees’ provident fund (EPF) issues have any message for Narendra Modi, it is a simple one. He is not managing his time and effort well. How can one say this about a man with awesome 18-hour days? The answer is working hard is not a substitute for working smart. He will achieve better results by working two hours less and using this time to understand the impact of the remaining 16 hours. The first question he must ask himself during his two-hour introspective session is this: how did I, once seen as a man who could communicate with the masses with such ease, manage to lose control of the public narrative so early in my tenure? Each of the above controversies (and these are not the only ones) has done Modi’s credibility great damage. The Vemula affair has antagonised at least Dalits, but no effort has been made to undo the damage. The Kanhaiya Kumar arrest - even if it had nothing to do with Modi - has given great ammo to his enemies, even enemies with discredited ideologies like Communism and Socialism. And the EPF issue, one of the most ill-thought-out ideas from babudom, has shaken the middle class like no other. It has shocked them that something so emotional as access to your retirement nest-egg can be threatened so easily. The middle class is Modi’s core constituency, and he has needlessly given them cause to rethink their support. However, the reason why he could fail politically is not because he may have misjudged the significance of events or made wrong policy choices occasionally - these can happen to anybody and can be remedied easily - but because of his own personality. I can see two serious handicaps which he needs to address urgently - and both relate to his reported strengths. One is inefficient use of his time as PM - which is a counter-intuitive point to make given that Modi is one of the hardest working PMs ever, with 18-hour workdays being routine for him. A deeper look at how our geopolitical model informs our forecasts. As a result, there are essentially two types of stories about Poland that make it to the Western media these days: Poland clashing with the EU (and therefore Germany) and Poland clashing with Russia. So the media picks up a statement about a Polish official's stance against German immigration policies or the Polish foreign minister saying the Council of Europe’s Venice Commission investigating changes to the way Poland appoints judges undermines the Commission’s credibility. Or the media picks up the Polish president saying for the umpteenth time that NATO should put more forces in Eastern Europe. The common thread linking these events: they are all simple and unsurprising public statements that make sense within a very defined way of understanding Poland. The hard work of understanding how and why Poland is changing as a result of the threats and advantages that surround it is often absent. Global warming will make it harder for people to eat more fruit and vegetables, leading to 500,000 deaths in 2050 that would otherwise have been avoided, according to a modelling study. 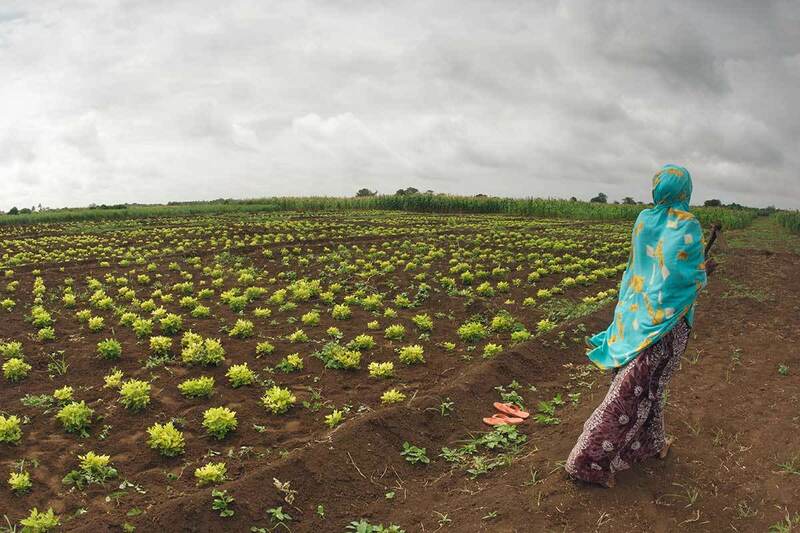 That means the biggest health impact of climate change in the short term could result from its effect on how much fruit and vegetables we eat, rather than from heat waves, starvation or the spread of tropical diseases. Can this possibly be true? Well, maybe, but such findings come with many caveats. Studying how climate change will affect the food we eat is far from easy. For starters, we don’t know how much greenhouse gas will be emitted, so a range of possibilities need to be considered. Next, the resulting changes in the climate have to be projected, yet different models and model runs produce slightly different results. Then these results have to be used to predict changes in food production and ultimately consumption, which is anything but simple. For instance, if it becomes harder to grow a particular crop, prices will rise and farmers will plant more of it. Peter Scarborough of the University of Oxford, whose team carried out the latest study, relied on an existing model called the International Model for Policy Analysis of Agricultural Commodities and Trade for this part. BEIJING — Big annual increases in China's defense budget have been fueling a top-to-bottom modernization drive that has brought in new equipment and vast improvements in living conditions for the People's Liberation Army's 2.3 million members. Even with the budget growing by a relatively modest 7-8 percent this year, the PLA can still be expected to continue adding the latest generation fighter jets, bombers, frigates, submarines and missiles. While the land forces still account for about 73 percent of total troop strength, China is shifting resources to the navy and air force. Those services will be responsible for dealing with the main perceived threats to China's interests — a conflict over control of the South China Sea and a move by self-governing Taiwan toward formal independence that China has threatened to respond to with force. That was a primary motivation behind President Xi Jinping's Sept. 3 announcement that the PLA would be reduced in size by 300,000 members, drawn mainly from noncombat units and those operating outdated weapons systems. Seeking an edge in air combat, China invested heavily in Su-27 jets from Russia, eventually copying that technology and producing its own version known as the J-11. Recent years have seen the introduction of an advanced homemade fighter jet, the J-10, and upgraded H-6 bombers capable of longer missions. At least two prototype stealth fighters have flown, although it's not known what they're capable of when, if at all, they'll enter service. China has also shot up the global ranks in drone technology, producing unmanned aerial vehicles comparable to the U.S. Air Force's Predator and Reaper models that are capable of high speeds, sustained overflight and launching missile attacks on ground targets. In this report, Wikistrat’s David K. Schneider analyzes China’s capabilities and intentions for projecting power into its near and far seas. He argues that China is unlikely to emerge as a new global maritime hegemon or peer competitor of the United States anytime soon. But it could emerge as a peer challenger in East Asia or in other theaters in cooperation with another regional peer competitor such as Russia — or even on its own, should the U.S. be occupied in more than one theater at the same time. Beijing is looking to a future in which China takes its place as a major world military power commensurate with its economic power and global interests. Key factors that could derail China’s grand maritime strategy, according to Schneider, include an end to its entente with Russia, conflict between the Communist Party and the army, and a more comprehensive American effort to block Chinese expansion. While the land forces still account for about 73 percent of total troop strength, China is shifting resources to the navy and air force. Those services will be responsible for dealing with the main perceived threats to China's interests - a conflict over control of the South China Sea and a move by self-governing Taiwan toward formal independence that China has threatened to respond to with force. That was a primary motivation behind President Xi Jinping's Sept. 3 announcement that the PLA would be reduced in size by 300,000 members, drawn mainly from non-combat units and those operating outdated weapons systems. CBS News correspondent Seth Doane reported that recent satellite images show military installations on China's man-made islands in disputed waters of the South China Sea despite assurances from Xi that it has no intention to militarize. Seeking an edge in air combat, China invested heavily in Su-27 jets from Russia, eventually copying that technology and producing its own version known as the J-11. Recent years have seen the introduction of an advanced home-made fighter jet, the J-10, and upgraded H-6 bombers capable of longer missions. At least two prototype stealth fighters have flown, although it's not known what they're capable of or whether or when they'll enter service. China has also shot up the global ranks in drone technology, producing unmanned aerial vehicles comparable to the U.S. Air Force's Predator and Reaper models that are capable of high speeds, sustained overflight and launching missile attacks on ground targets. In this file photo taken Sept. 3, 2015, the front of the Wing Loong, a Chinese made medium-altitude long-endurance unmanned aerial vehicle, moves past spectators during a parade commemorating the 70th anniversary of Japan's surrender during World War II held in Beijing. Equally dramatic has been the transformation of the People's Liberation Army Navy from a coastal patrol force to one capable of operating on the high seas far from base. The most eye-catching addition has been the commissioning of the navy's first aircraft carrier that was purchased as an incomplete hull from Ukraine more than a decade ago then rebuilt, armed and equipped in China. Although the carrier, christened the Liaoning, has yet to take on its full aviation complement, China announced in December that it was already building its second aircraft carrier, this time entirely with domestic technology. China is also adding cutting-edge frigates, destroyers and nuclear submarines and by some estimates has been launching more vessels than any other nation on an annual basis. That rapid modernization is seen as aimed at asserting its maritime claims and extending its power far from its shores, raising tensions with Japan, the U.S. and Southeast Asian nations with rival territorial claims. 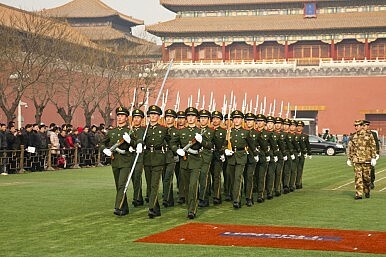 China's missile force, formally known as the Second Artillery, has one of the most potent attack capabilities of any of the world's armed forces. Along with its nuclear force, China now fields at least 1,200 conventionally armed ballistic missiles, along with an array of land attack cruise missiles, surface-to-air missiles, and - of greatest concern to the U.S. Navy - anti-ship cruise and ballistic missiles that may be able to sink an aircraft carrier. China has continued to build its stocks of short- and medium-range ballistic missiles deployed just across the 160-kilometer (100-mile) strait from Taiwan, backing up its threat to attack the island should it irrevocably reject Beijing's demand for unification. Along with its gradual shift away from Asian land war preparations, the PLA has been developing systems to prevent outside intervention in contingencies such as a campaign against Taiwan. It's doing so largely through its use of missiles and submarines, along with cyber warfare efforts to disable opposing forces' high-tech battle systems. The PLA has also reorganized its structure to better integrate its different services. It's even shifting some of the longstanding political principles underpinning the PLA's use of force, moving to set up a logistics center in the African Horn nation of Djibouti that some are calling China's first overseas base, despite Beijing's longstanding disavowal of any form of foreign alliance or permanent overseas presence. European governments refuse to work together to deal with the migration crisis. 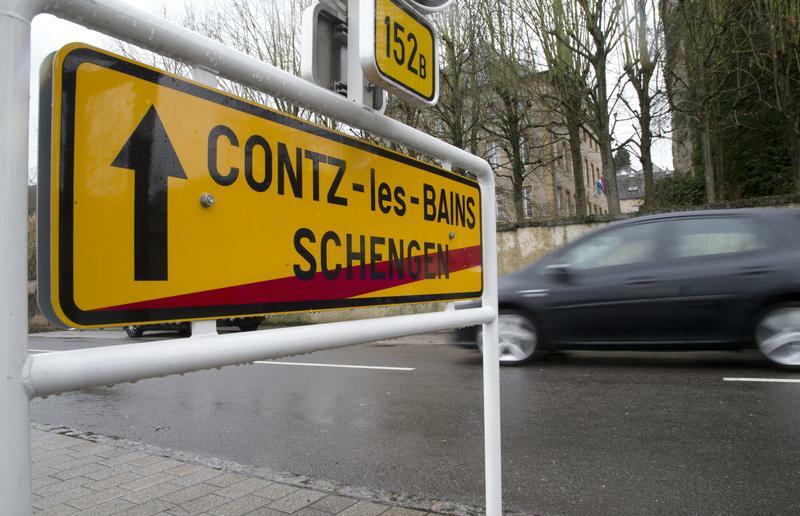 Putting on hold the Schengen passport-free travel area could shift attitudes. It is time for the European Union to suspend the Schengen Agreement. To hold on to the myth that the EU's arrangement of passport-free travel continues to work amounts to self-denial. Several European countries have already reimposed border controls to quell or restrict the flow of refugees and migrants. Belgium became the most recent example when it introduced checks on its border with France on February 23. And because Greece is now saddled with having to cope with the thousands of refugees reaching its shores from Turkey, there was a suggestion in Brussels that Greece be suspended from Schengen-as if that would solve the refugee crisis. That suggestion, thankfully shelved, showed how the EU Council of Ministers, which represents the member states, was yet again trying to pass the buck and continue the blame game. Both must stop. Collectively, the EU member states share responsibility for this catastrophic mess they find themselves in. Yes, many of them, especially the Visegrád countries of the Czech Republic, Hungary, Poland, and Slovakia are quick to point the finger at Germany, even suggesting thatChancellor Angela Merkel is responsible for this crisis. But these accusations are disingenuous. It is the member states that have failed Schengen. Summary: Stratfor describes Europe next step towards a cashless society, and why they are making it. This is one of the largest increases in government power since the invention of fiat currencies and the income tax. Watch this process, perhaps coming soon to America. The elimination of the euro’s highest denomination is the latest step in a longer-term move toward a cashless society, prompted by factors such as the growing use of negative interest rates and capital controls worldwide. The eurozone has found a new scapegoat for international crime: the 500-euro note. The Continent’s leaders are seriously discussing decommissioning the euro’s highest denomination, which is favored by crime groups for transferring massive sums across international borders. Eliminating the bank note could help temper criminal activity, but in reality the implications are much broader. The idea is just the most recent step in an ongoing process moving Europe, and indeed the world, closer to an entirely cashless economy. European authorities have long known that high-denomination bills are a boon for the criminal underworld, but the publication in February of a paper by Peter Sands, a Harvard academic and former CEO of Standard Chartered, accelerated the campaign to phase out the 500-euro note. The widely read paper, “Making it Harder for the Bad Guys: The Case for Eliminating High Denomination Notes“, is an exhortation to world leaders to eliminate their high-denomination notes because they make it easier for criminals to move money internationally. Sands specifically names the 500-euro note as the first that should go because of its high usage in criminal networks, but he foresees the same fate for the 1,000-Swiss franc, 10,000-yen notes and the $100 bill. Here are a few things the West can do against Moscow’s potent combo of special forces and electronic warfare. The Ukrainian soldiers peered over the cold dirt edge of their trench. The artillery had abated, but the whine of a nearby spotter UAV promised its imminent return. In the distance, they could see camouflaged spetsnaz moving into position with suppressed Vintorez marksman rifles. Looking at his radio, a lieutenant dared to hope. “Aleksei, you see this? Radio’s working. Maybe a break in the jamming.” “Is that really a good thing?” his sergeant responded. “Go ahead and call, that’s what they want. The Russians will hear you first and send their thermobaric regards. That is if the spetsnaz don’t get here first.” The young officer slumped. His comms gear was useless; he and his men were cut off and alone. Much has been written about Russia’s innovative concepts of operations in Ukraine and Syria, variously dubbed “hybrid” or “non-linear” war, but specific tactics have received far less scrutiny than they deserve. A look, in particular, at Russia’s use of electronic warfare (EW) and special operations forces (SOF) suggests ways that U.S. and other NATO forces might prepare to counter them. The positioning of EW forces in the Russian order-of-battleunderscores their importance. Every military district houses an independent EW brigade, supplemented by strategic battalions with specialized EW equipment and a special independent EWbrigade carrying the title “Supreme Main Command” (only two other units in the Russian Armed Forces reportedly carry this title). 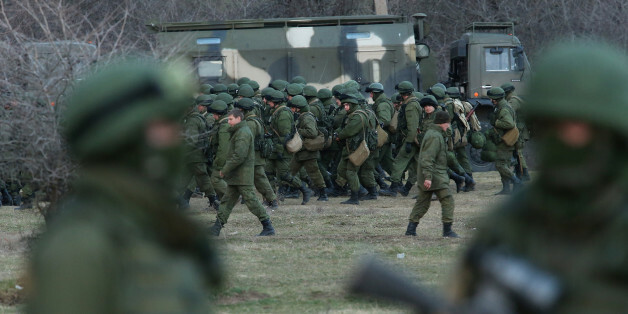 In Ukraine, Russia frequently jams its enemies’ tactical communications through a variety of means. During the initial Crimean seizure, cellphones in the area were reportedlyjammed by Russian warships. As the conflict moved to the Donbas, pro-Ukrainian and OSCE UAVs found their data links persistently jammed. Further, Russian UAVs that can carry theLeyer-3 jammer and direct artillery fire have been spotted inUkraine and Syria. Where Ukrainian forces have acquired encrypted radios, Russian EW troops hone in on their stronger signal to geolocate their position. These and many similar tactics enable Russia to erode its adversaries’ intelligence-gathering, communications, and command and control. Russian EW gear may even threaten strategic collection platforms like low-earth orbit spy satellites, airborne surveillance systems. While the Russian armed forces have declined by about 80 percent since the Cold War the government is currently running a propaganda campaign (mainly via mass media and the Internet) portraying Russia as capable of posing a major military threat to the West. That is more fiction than fact and perusing Russian language print media and Internet discussions provides lots of details. Russian military personnel and any Russians who care to pay attention know that Russia is much worse off versus its Cold War adversaries (mainly NATO) now than in 1991 (when the Soviet Union collapsed). The problem Russia does not like to talk about is that while Russian forces shrank 80 percent during the 1990s those of its adversaries declined by less than half. Worse NATO nations replaced or upgraded much of their older and obsolete equipment after 1991. At this point NATO has four times as many troops as Russia. Until 1991 Russia had more troops than NATO. Worse still is the fact that NATO nations account for nearly 60 percent of all military spending on the planet, about ten times what Russia spends. That underlines the major Russian military weakness; the inability to replace aging weapons after 1991. Russia was in the midst of trying to remedy that when the price of oil (the main source of for the government budget) dropped by over 70 percent. Then came the economic sanctions in response to Russian attacks on Ukraine and threats to do likewise to other East European nations. Until 1991 Russia was a very real conventional military threat to its neighbors (especially the NATO nations of Europe). That is no longer the case although Russia is a threat to new NATO members in East Europe, but only if they want to risk defeat because of the mutual defense clause of the NATO treaty. The one Cold War era threat Russia retains is a diminished but still potent nuclear weapons capability. This, however, is still a doomsday solution for Russia if used. Retaliation would be devastating, but as a threat nuclear war is still as badass as it gets. At this point it is all Russia really has left, all else is theater and illusion. The most likely targets for another Russian invasion are three small nations (Lithuania, Latvia and Estonia) on the south coast of the Baltic Sea between Russia and Poland. In the 18th century the Baltic States were forcibly incorporated into the expanding Russian empire. They became independent after World War I (1914-18) but were taken over again in 1940. It wasn’t until 1991 that the Baltic States regained their independence and they are determined to keep things that way. Meanwhile Russian backed forces in Ukraine are maintaining their positions and generally observing a ceasefire by not making major moves. This is largely because economic problems in Russia and the need to divert most military attention to the situation in Syria. Russia believes time is on its side in Ukraine because Ukraine is suffering more economic and political problems than Russia. Corruption has been a major problem in Ukraine since 1991 (and before). Even the obvious Russian military threat has not persuaded a lot of powerful Ukrainians to shut down a lot of their profitable corrupt practices. As a result of that, the war and economic sanctions by Russia, the Ukrainian GDP shrank 10 percent in 2015. Worse, if action is not taken on corruption a lot of Western economic aid will be cut or never arrive. It may prove beneficial to leverage the internet of things (IOT) in order to provide our Soldiers, Sailors, Airmen and Marines the decisive advantage needed to fight and win future armed conflicts. It can be anticipated that connected devices such as game consoles, “baby monitors” (1) and “that smart meter (that) knows when you’re home and what electronics you use when you’re there” (2), for example, will be prolific in the future operating environment. With this in mind, the joint force will have opportunities to use these devices to gain and maintain situational awareness in a mega city or dense urban environment. Before Soldiers enter a building or deploy an unmanned system, they may have opportunities to access these existing “sensors” to build a picture of the building’s interior. Also, being able to access personal electronic devices of the buildings occupants could, coupled with the deployment of unmanned systems, give the Warfighter a better picture of what awaits behind the next door, wall, room or floor. Not only knowing about the location and patterns of life of enemy combatants in the building and the ability to find out where non-combatants are would increase protection of the Warfighter, as well as, reduce the risk of civilian casualties. The data obtained from these connected devices, personal electronic devices and deployed unmanned systems would be rapidly stitched together to render a real-time 3D model of the building, as well as, show locations of the structure’s occupants. An example of this can be seen in the films “Prometheus,” (3) and “The Dark Knight” (4). This would give the Warfighter the needed edge to fight and win in complex urban terrain. In addition to finding out how many occupants there are as well as their location, the Soldier will also need to gain and maintain situational awareness outside of buildings by being able to access traffic cameras, security cameras and so forth. Building a comprehensive, living model of a city or even a city block would enhance situational awareness and provide the necessary data for leaders to make rapid decisions and increase the protection of the combat element in an operational environment. This composited data could also be shared so that the operational commander would have a real-time view of the area of operations. Big Data Analytics and knowledge management / decision-making tools will be needed in order to filter and make sense of all of the data being obtained. Commercially available unmanned aerial vehicles (UAVs), popularly known as drones, appear to be changing the game in regards to aviation. The market for drones has been expanding rapidly, the applications of drones are growing more diverse, and the cost of the machines themselves is dropping. There are plans to try and use drones to revolutionize everything from shipping to border control, and the trend towards greater use of UAVs shows no sign of slowing. However, the growing number of UAVs flying in American airspace is beginning to create a problem for law enforcement and security organizations, due to concerns about drones being used as weapons. As UAV technology has become more ubiquitous, the fear of drones being used for nefarious purposes has grown as well. For example, it would not be inordinately difficult to strap explosives to a commercial UAV and convert it into a flying bomb. Given that a UAV was able to land on the White House lawn in January 2015, the potential damage that could result from such an attack is a serious national security concern. Additionally, there are fears that drones could be used to intentionally cause passenger planes to crash by flying into their engines. As a result, the growing number of UAVs seen loitering near airports is a persistent cause for concern. Of all the potentially transformational military technologies that will appear over the next ten years, hypersonic strike weapons, and ultimately, hypersonic platforms, could radically transform future military operations as well as open up the prospect of cheaper and more responsive access to space. The United States, Russia (here and here), China (its programs discussed below) and India(and here) as well as Australia (here and here) all have R&D projects aimed at developing hypersonic propulsion or understanding the science of hypersonics. Hypersonic flight occurs at velocities five times above the speed of sound (Mach 5 = 6,174km/hr), and current research into hypersonic propulsion is focusing on the Mach 5 to Mach 10 (12,348km/hr) realm based around supersonic combustion ramjets, or ‘scramjet’ engines. The United States’ X-51 scramjet demonstrator flew twice successfully (though three times unsuccessfully) between May 2010 and May 2013, and in the process provided valuable data that may lead to the development of scramjet-based weapons in the future. China also claims to have flown their own scramjet in October 2014, and the United States and China have both tested hypersonic glide vehicles (HGVs). China’s DZ-ZF (previously known as the Wu-14) HGV has flown several times, most recently on November 23, 2015. The development of hypersonic weapons implies that in future warfare, particularly between major states, speed will assume prominence as a factor for determining victory, alongside information. For example, in considering the implications for the survival of naval surface combatants of China’s early tests of the Wu-14, Andrew Davies noted that hypersonic weapons reduce time of response for defenders to the point where a viable anti-ship missile defense with the traditional layered approaches becomes largely impossible. Instead, naval forces will need new and more responsive technologies like directed energy weapons, electromagnetic railguns or defensive hypersonic missile systems. Ben Schreer suggests that hypersonic weapons indicate a new era of high speed warfare, which reinforces a first strike incentive in a manner that’d be highly destabilizing in a crisis, and suggests a new “cult of the offensive,” where the side which strikes first most likely wins. Do We Have to “Go Off the Grid” In Order to Escape the Eavesdroppers? Why are the intelligence agencies revealing their spying techniques? Legalised hacking in the UK now allows a third party to take control remotely of a phone’s camera or microphone and record video and conversations taking place, the Guardian’s Alan Travis reported this week. What’s the point of Apple trying to encrypt its iPhones if the spooks can switch them on remotely and monitor what we are doing? Until recently, the security services have gone to great lengths not to disclose their operational capabilities. If the bad guys know how their communications can be monitored, they’ll look for other ways of exchanging information. So it’s something of a surprise to see how open the agencies have now become. Ciaran Martin, director of cybersecurity at GCHQ, gave evidence recently to the investigatory powers tribunal about what’s now called “equipment interference”. If the new investigatory powers bill becomes law, warrants permitting interference with equipment will be issued by a secretary of state and approved by a judicial commissioner. Under clause 88, this would include “observing or listening to a person’s communications or other activities”. In evidence to the tribunal, Martin explained that equipment interference might involve installing an implant into a laptop or mobile, perhaps by persuading a user to click on a link. A simple implant would transmit information over the internet. But others “might monitor the activity of the user of the target device or take control of the computer”. This presumably includes switching on a device’s camera and microphone, even when it’s not being used to make calls. Martin accepted that such operations could be “highly intrusive”. But so is someone hiding a camera in your bedroom, which will not require prior judicial authorisation. Destructive skirmishes are taking place in cyberspace right now, and increasingly they’re spilling into people’s daily lives. No one’s claimed responsibility, but the grid had been hit by an online attack that took out the system remotely. Experts agree on a likely suspect: the Russian government, headquartered more than 800 miles away. The outage is just one example of the growing threat of cyberwar, a practice that’s become a primary focus of governments and terrorist organizations worldwide. Underlining this point, the US has started going public with its own attacks. On Monday, Department of Defense Secretary Ash Carter said that the US is hitting ISIS systems with cyberassaults. The attacks aim “to cause them to lose confidence in their networks, to overload their networks so they can’t function,” Rogers said, according to multiple reports. He didn’t provide details, and the Department of Defense didn’t respond to a request Friday for more information. If we didn’t know it already, the Ukraine attack and Ash’s remarks make it clear there are destructive skirmishes taking place in cyberspace right now, and increasingly they’re spilling into people’s daily lives. Sen. John McCain (R-AZ), chairman of the Senate Armed Services Committee, clashed with top U.S. Air Force officials over the fate of the A-10 Warthog close air support aircraft and Russian-made rocket engines. While the Air Force has finally conceded that the stealthy fifth-generation F-35 Joint Strike Fighter will not be able to replace the ungainly flying tank, the service still plans to retire the A-10 by 2022. In the Warthog’s place, the Air Force hopes to use the Lockheed Martin F-16 Fighting Falcon and the Boeing F-15E Strike Eagle—which are not as effective in the close air support role as the A-10. McCain, however, was not mollified. The senator noted that the A-10 is still—by far—the lowest cost and most effective close air support platform ever built. The senator further noted that the A-10 is performing exceptionally well over Iraq and Syria in the fight against ISIS. Welsh tried to push back—he noted that the service had used both the F-15E and F-16 against ISIS. McCain, however, was not having any of it—calling Welsh’s testimony “embarrassing.” The senator noted—as numerous Air Force sources have repeatedly stressed—that there is no close air support aircraft remotely as capable as the Warthog. “Every Air Force pilot that I know will tell you that the most effective close air support system is the A-10,” McCain said. 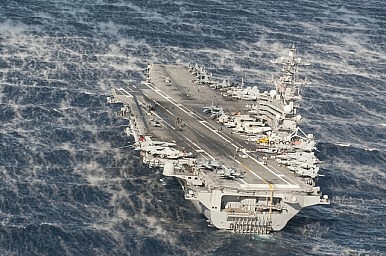 Over the last several months, the debate about the future of the United States’ nuclear-powered carrier (CVN) fleet has picked up speed again, with several major contributions coming from both sides of the aisle. Back in October, Seth Cropsey, Bryan McGrath, and Timothy Walton published their very detailed take on how to keep the carrier weapon system in the game. Not long after, well-known carrier critic Jerry Hendrix followed up on his earlier thinking on the subject in Retreat from Range: The Rise and Fall of Carrier Aviation. Most recently, Kelley Sayler contributed a study on theGrowing Threat to U.S. Aircraft Carriers. The issue was also discussed at length in House Armed Services Committee hearings on February 11, 2016.